Pulsatile tinnitus is heard synchronously with each heartbeat. This form of tinnitus heightens a suspicion of a vascular etiology, meaning that the blood vessels around the inner ear may be causing the problem. 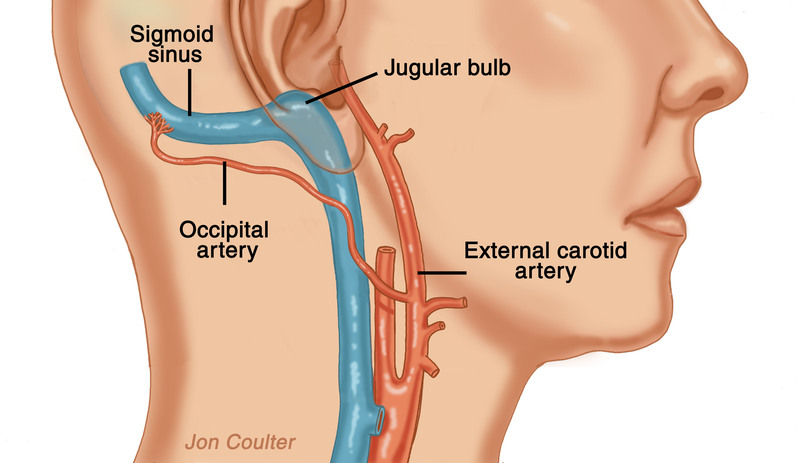 The most common vessel to be involved is the carotid artery in the neck that carries blood from the heart to the face and brain. 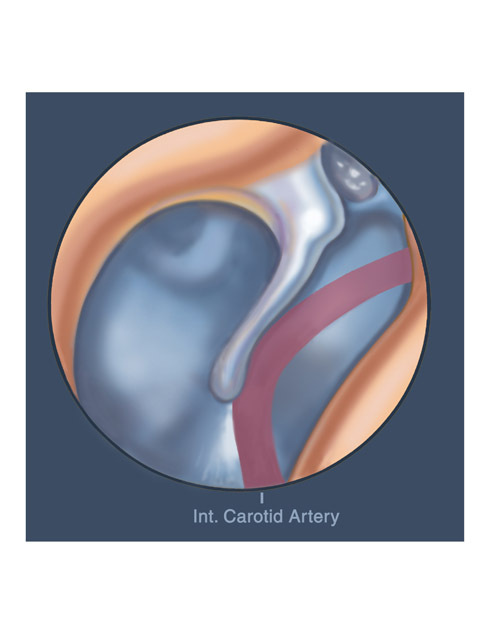 Plaques within the carotid artery that build up over time can cause turbulent flow, and the pulsations can be transmitted to the inner ear. Occasionally, this turbulence can be heard with a stethoscope. There are a number of tests that can be used to diagnose this condition. Ultrasound studies of the carotid artery may be of some use. Magnetic resonance angiography (MRA) is a special MRI configured to looking at the blood vessels. Conventional angiography is probably the most accurate way of detecting a problem within the carotid artery. Here, X-rays of the neck and skull base are taken while dye is injected into the carotid artery. Detection of carotid artery plaques should lead to consultation with a vascular surgeon. The occipital artery is inappropriately connecting to the sigmoid sinus vein. Arteries normally take blood away from the heart and empty into smaller-sized vessels, arterioles. Eventually the blood enters the tiniest of blood vessels called capillaries. Blood is then returned to the heart via small-sized veins, venules and the larger veins. Sometimes, an artery can empty blood directly into a vein, bypassing the capillary bed. This situation is called an arteriovenous malformation. When this occurs near the inner ear, the turbulent flow can be heard with each heartbeat. Treatment of this disorder involves angiography with embolization. This involves threading of a plastic tube from a vessel within the groin up toward the area of the malformation. Dye is injected and X-rays are taken to confirm the presence of the abnormality. Particles are then floated into the feeding artery to clot it off. 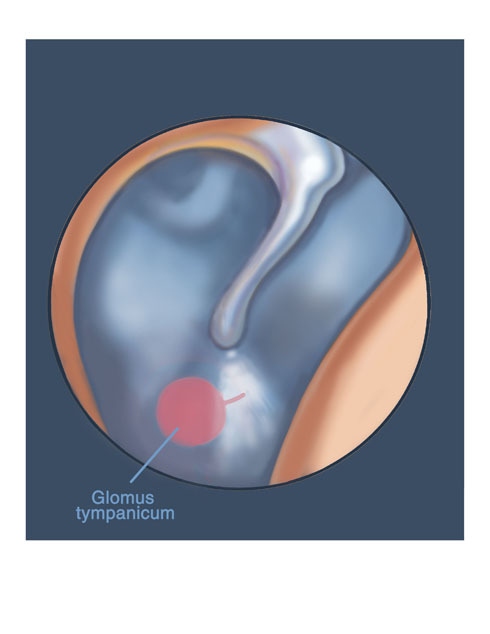 Here, a glomus tympanicum is seen pulsating in the middle ear. Here, a glomus jugulare is seen pulsating in the jugular bulb. A number of tumors can also cause pulsatile tinnitus. Paraganglioma are known to cause pulsatile tinnitus. Less commonly, meningiomas and schwannomas can also cause these symptoms. Meningiomas are benign tumors that arise from the covering of the brain. 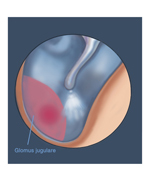 Schwannomas are benign tumors that arise from nerves entering or leaving the brain. The internal carotid artery is inappropriately contacting the malleus of the middle ear, which is in close contact with the inner ear. The internal carotid artery is the vessel that supplies blood to the brain. This vessel normally travels very close to the cochlea. On rare occasion, the vessel may travel directly over the surface of the inner ear. In this instance, the carotid pulsations can be heard with each heartbeat. This is a condition that is difficult to treat. Benign intracranial hypertension, or pseudotumor cerebri, is a condition seen in young, obese females when there is increased pressure within the head. When associated with an ear infection, the condition is called otitic hydrocephalus. Pulsatile tinnitus may be associated with headaches, hearing loss, imbalance, and blurred and double vision. This disorder remains poorly understood. High or low levels of vitamin A may be associated with this condition. Treatment is related to correction of the increased pressure either by diuretic medications or by serial lumbar punctures (spinal taps). There is an association between excess levels of Vitamin A and benign intracranial hypertension. The connection is not clear. Excess levels of Vitamin A have been found in the spinal fluid and serum of many patients with BIH. 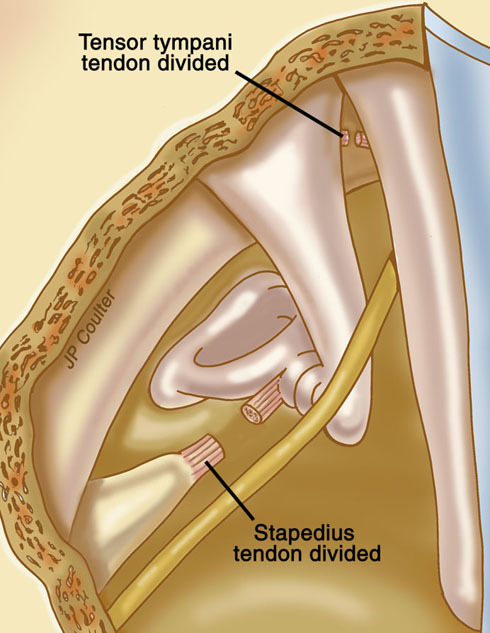 The stapedius muscle and tendon is attached to the stapes bone in the middle ear. The stapedius tendon in divided to stop spasms of the muscle. Tinnitus described as a fast, rhythmic clicking may be caused by involuntary twitching of muscles in the middle ear. 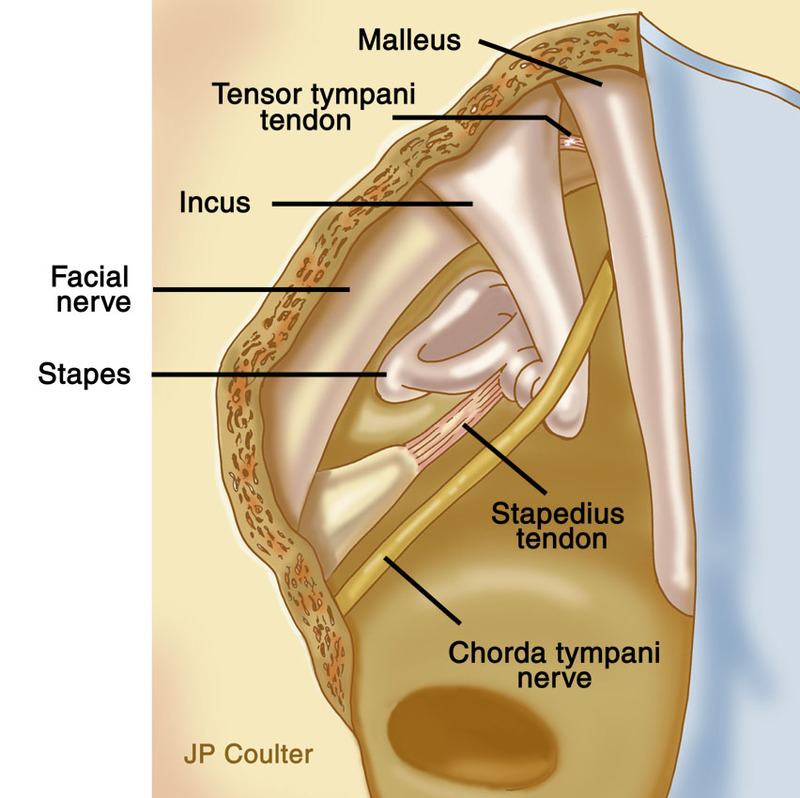 The tensor tympani and stapedius muscles are attached to the ossicles (bones) in the middle ear. For unknown reasons, these muscles can have periods of spasm. Sometimes, this disorder is also related to uncontrollable facial twitching. If the symptoms become troubling, a minor procedure done through the ear canal with division of the tendinous attachments to the ossicles is highly effective. Non-pulsatile tinnitus is more common. More commonly, an underlying reason for the ringing cannot be found. Exposure to loud noises, use of certain medications, and an underlying hearing loss are just some of the causes of ringing in the ears. After exposure to loud noise over a period of time, it is not uncommon to have a temporary hearing loss associated with tinnitus. Usually, both the hearing loss and tinnitus will improve with time. Certain medications can also cause tinnitus, such as aspirin and quinine-containing medicines. Occasionally, stopping these medications or switching to others can be helpful. Consult with your physician before doing either. Sensorineural hearing loss can be associated with tinnitus. Frequently, a hearing aid can help mask out the tinnitus so it becomes less noticeable and can also provide better hearing. Tinnitus associated with a sensation of ear fullness, dizziness, and hearing loss should raise suspicion for Meniere's Disease. Tinnitus occurring in one ear may be caused by a benign tumor called an acoustic neuroma.